In summarizing all the Books where we have presented women dressed in men's redingotes, it will be easy to see which were temporary variations of Fashion. Here is another redingote which shows that its progress has not relented. It was the most difficult step to get over, and it was overcome; it was the most brilliant shape and the most agreeable to take, and it has taken hold. 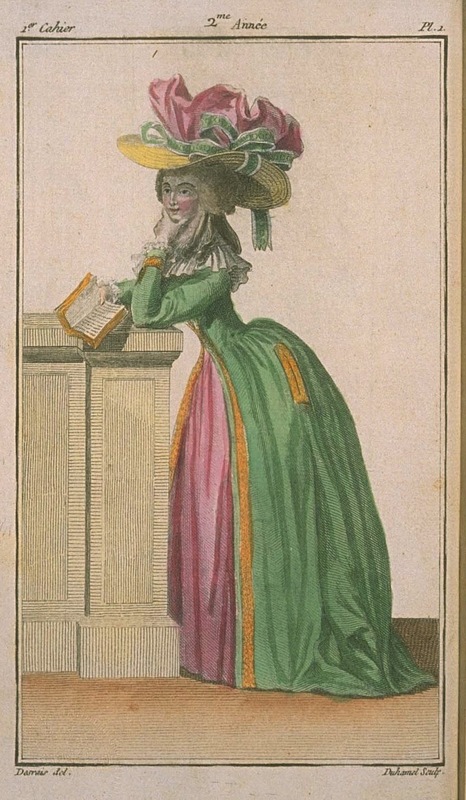 The Woman shown in PLATE I wears a redingote of dark green wool, embroidered with gold on the fronts, on the side pockets, cut vertically, and on the cuffs. Under this redingote, a petticoat of glossy pink. On the neck, a full gauze kerchief, en chemise, with two collars. On her feet, pink shoes, flounced with a green ribbon. On her head, a straw hat, lined with canary's tail taffeta or satin, with black stripes, whose very full crown is of pink crêpe, with little black stripes, and which is belted with a wide pale green ribbon, edged in white, pulling up the hat on the right side, holding it inclined on the left side, and forming on this side a large bow, whose ends fall very low in the back. Her hair is frizzed in a tapet to the middle, and in large curls from the middle to the end. In the back, it is pulled up in a flat chignon. Two large curls fall floatingly over the chest of this woman, who is supported by a plinth and holds a book in her hand.